Atlanta Caribbean Gospel Song Competition Finals. Saturday September 23, 2017. featuring Keisha Peart, Folake Aiyeyomi and Yvonne Johnson. ACGSC Finalists Natasha Mullings, Samantha Jackson and Grace Kafoui Thomas. Buy Tickets online at www.acgsc.net or call 678480-1161 for more info. Inaugural ACGSC (Atlanta Caribbean Gospel Song Competition) at the Marriott Hotel Stonecrest Mall Georgia. The ACGSC is open to persons fifteen (15) years and above. There are NO restrictions on gender (male or female). Applicants can only submit one (1) song per entry and may enter as a single, duo or group. Groups and duos will be treated as one entity. A maximum of 8 members per group (including band members) are allowed. Applicant must not have any current recordings within the past 3 years. In segment three (3), each contestant will perform two (2) selections: (1) The full version of their original song in acapella (vocal only); and (2) A gospel cover song of their choice with the sound track. Each contestant will be judged by a panel of music experts. The three (3) contestants with the highest points will be selected as the top three (3) finalists. The three (3) contestants chosen will be notified by email and/or by telephone. During this segment the top three (3) finalists will record their original song at Studio Max Records. The songs recorded will be aired on radio and television. Contestants will be scheduled for promo music video and photo shoot, public appearances at events, publications (including social media) and band rehearsals for the ACGSC final show down. Again, each contestant will be judged by a panel of music experts at the ACGSC Finals September 2017. 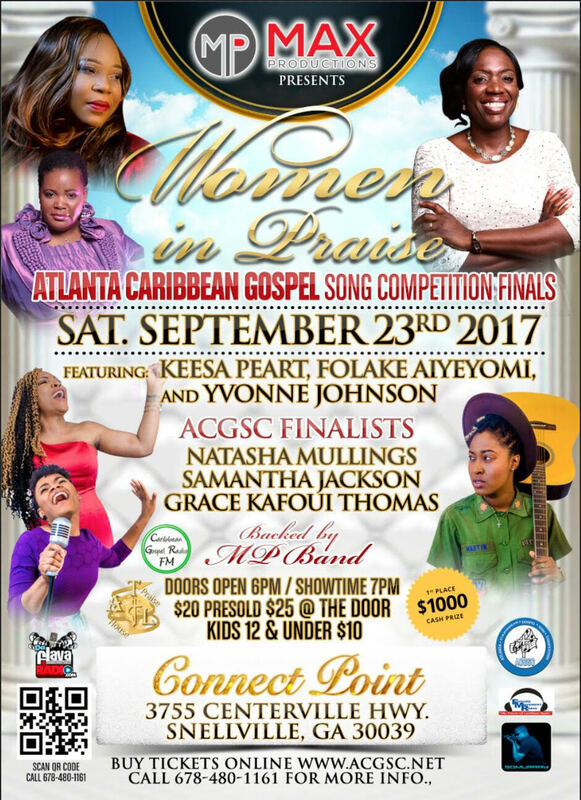 Max Productions presents the 1st place winner of the 2017 Atlanta Caribbean Gospel Song Competition.